How does the proposed GST structure affect automobile prices in India? Last month, the much-anticipated Goods and Services Tax (GST) was proposed and is scheduled to be in practice from July 1, 2017. With the different structures proposed across the segments, it did attract mixed reactions from the Indian automobile fraternity. 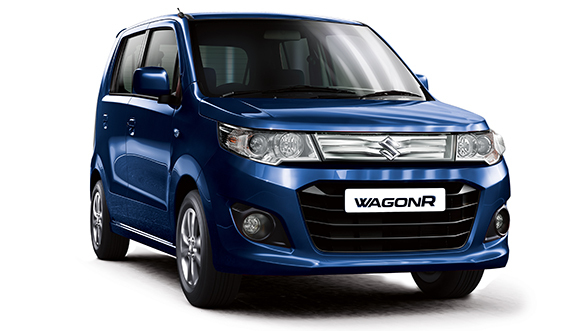 However, for the customers, it has been a welcome change as car manufacturers like Maruti Suzuki and Mahindra offered a discount of Rs 30,000 on the Wagon R and Rs 1 lakh on the XUV 500. Even more premium brands like Mercedes-Benz and Audi went ahead offering discounts ranging from Rs 1.2 lakh to Rs 7 lakh. Here is the detailed breakdown on how and why automobile manufacturers are offerings such discounts. In case of the two-wheelers, presently the collective tax levied includes 12.5 per cent excise duty, 12.5 per cent VAT, 2 per cent CST (Central Sales Tax) and 1 per cent NCCD (National Calamity Contingent Duty). This makes a total of approximately 30.2 per cent. The GST structure will be replacing the central excise duty and service taxes that are collected by the central government. Accordingly, the duty of 30.2 per cent has been reduced to 28 per cent for two-wheelers with a displacement less than 350cc. Honda Motorcycle & Scooter, Bajaj and Royal Enfield have already started passing on the benefits to their customers by offering pre-GST schemes and offers. However, for the two-wheelers with a displacement more than 350cc, the duty is said to go up to 31 per cent. 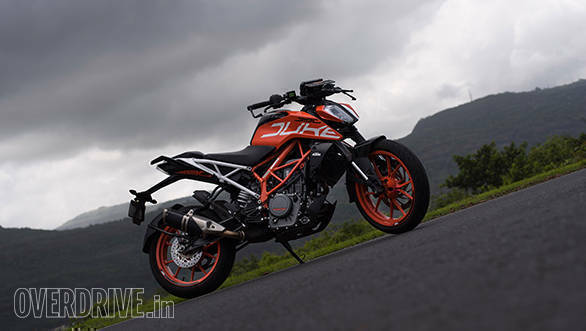 This will make premium motorcycles ranging from the KTM 390 Duke, Yamaha R3 and other higher-displacement offerings to be more expensive depending on applicable state tax rates. Coming to four-wheelers, the duty structure for sub-4m cars was 12.5 per cent excise duty, 12.5 per cent VAT, 2 per cent CST, 1 per cent NCCD and 1 per cent infra cess. This made a total of approximately 31.4 per cent. This has been brought down to 29 per cent which includes a base rate of 28 per cent and 1 per cent additional cess. While this is for petrol cars, the diesel models were charged a sum of approximately 33.4 per cent which has been reduced to 31 per cent. 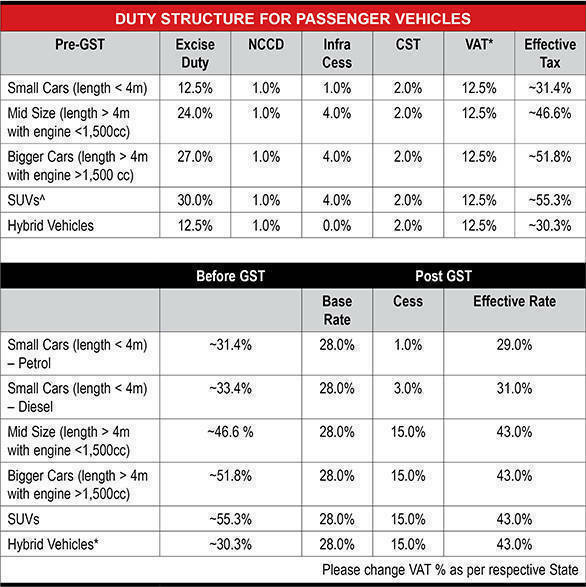 For vehicles with a displacement of less than 1,500cc and more than 4m in length, 24 per cent excise duty, 12.5 per cent VAT, 4 per cent infra cess, 2 per cent CST and 1 per cent NCCD were charged. This total of 46.6 per cent has been brought down to 43 per cent which includes 28 per cent base rate and 15 per cent cess. Even cars with a displacement of more than 1,500cc and a length greater than 4m are believed to get cheaper as the 51.8 per cent duty will be reduced to 43 per cent. Similar is the case with SUVs which will attract a lower duty of 43 per cent instead of the present 55.3 per cent. However, the segment that has received criticism are the hybrids. The hybrid cars sold in India attract 12.5 per cent excise duty, 1 per cent NCCD, 2 per cent CST and 12.5 per cent VAT. This total of 30.3 per cent will be increased to 43 per cent wherein 28 per cent will be the base rate and 15 per cent will be cess. This will make hybrid cars more expensive in India. 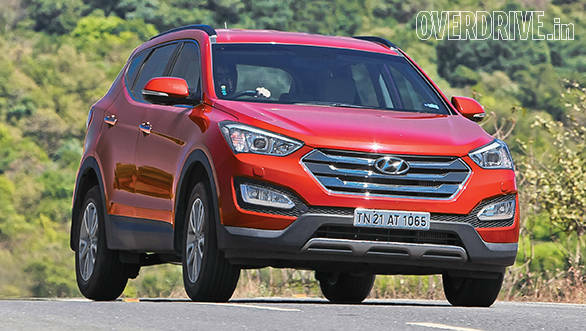 "The placement of green vehicles in highest slabs of GST is contrary to the spirit of promoting green mobility in India and will adversely impact the hybrid vehicle acceptance in future," said Rakesh Srivastava, director, sales and marketing, Hyundai India. While the above is the proposed duty structure across segments for two- and four-wheelers, the final details will be announced once the GST structure is out on July 1, 2017.